A carbon coating on a stent having a bioactive agent covalently attached thereto and methods of making the same are described. This is a non-provisional application of U.S. provisional application No. 60/817,229, filed Jun. 27, 2006, the teaching of which is incorporated herein by reference in its entirety. This invention generally relates to covalent attachment of biologically active agents to a carbon coated stent. Although stents work well mechanically, the chronic issues of restenosis and, to a lesser extent, stent thrombosis remain. Pharmacological therapy in the form of a drug delivery stent appears to be a feasible means to tackle these issues. Polymeric coatings placed onto the stent serve to act both as the drug reservoir and to control the release of the drug. One of the commercially available polymer coated products is stents manufactured by Boston Scientific. For example, U.S. Pat. Nos. 5,869,127; 6,099,563; 6,179,817; and 6,197,051, assigned to Boston Scientific Corporation, describe various compositions for coating medical devices. These compositions provide to stents described therein an enhanced biocompatibility and may optionally include a bioactive agent. U.S. Pat. No. 6,231,590 to Scimed Life Systems, Inc., describes a coating composition, which includes a bioactive agent, a collagenous material, or a collagenous coating optionally containing or coated with other bioactive agents. Subacute thrombosis and neointimal hyperplasia are considered to be the leading complications after stenting. Various factors are believed to be involved in the process. Methods for reducing thrombosis and restenosis have been previously proposed. However, those methods are less satisfactory for reducing late thrombosis and/or restenosis associated with stenting. Therefore, there is a need for a coating on a stent that provides for reduction of early and late thrombosis and/or restenosis. The embodiments disclosed herein address the above described problems. The present invention describes a method for forming a carbon coating on an implantable device. The carbon coating includes a bioactive agent attached thereto. Combination of a bioactive agent (e.g., SODm, pegylated active agent and/or heparin) and carbon can address more than one factor leading to neointimal hyperplasia or subacute thrombosis and may thus reduce early or late thrombosis, and restenosis. Therefore, when the bioactive agent is removed by the body after implantation, the underlying carbon surface can still provide high degree of biocompatibility. As used herein, the carbon coating generally includes two to four covalently linked carbon (C), hydrogen (H), silicon (Si), and oxygen (O) atoms. In some embodiments, a bioactive agent can be attached to the carbon coating without surface modification of the carbon coating. For example, a carbon coating can be exposed to a photo-reactive chemical (PRC) or a thermo-reactive chemical (TRC), which includes at least one reactive group. A light or heat can then be applied to the carbon coating and the PRC or TRC. The PRC or TRC can then generate radicals which can extract hydrogen radicals from the carbon surface to allow the PRC or TRC to covalently link to the carbon coating surface. A bioactive agent can then be covalently attached to the PRC or TRC via the at least one reactive group. In some embodiments, the attachment of the bioactive agent to the PRC or TRC can be carried out prior to attaching the PRC or TRC to the carbon coating so as to form a carbon coating having bioactive agents attached thereto via the PRC or TRC. Any bioactive agent can be attached to a carbon coating according to the method described herein. An implantable device bearing such a carbon coating can be used to treat, prevent, or ameliorate a disorder in a human being by implanting in the human being (e.g., a patient) an implantable device described herein. The disorder can be, e.g., atherosclerosis, thrombosis, restenosis, hemorrhage, vascular dissection or perforation, vascular aneurysm, vulnerable plaque, chronic total occlusion, claudication, anastomotic proliferation for vein and artificial grafts, bile duct obstruction, ureter obstruction, tumor obstruction, or combinations thereof. As used herein, the carbon coating generally includes two to four covalently linked carbon (C), hydrogen (H), silicon (Si), and oxygen (0) atoms. A carbon coating can be deposited via plasma assisted chemical vapor deposition (CVD) from ART, Inc. This coating has good adhesion and mechanical properties as a stent coating. An ART carbon coating can contain four covalently linked carbon (C), hydrogen (H), silicon (Si), and oxygen (|O|[Al]) atoms. The coating comprises a diamond-like material having an interpenetrating network, one of which is rich in carbon while the other is rich in silicon. Another example is diamond-like carbon coating, which may contain only two elements, i.e. carbon and hydrogen. In some embodiments, the carbon coating can include other elements or materials such as a metal element(s) such as iron (Fe), silver (Ag), gold (Au), Magnesium (Mg), calcium (Ca), potassium (K), or sodium (Na), titanium, zirconium, niobium, tantalum, and hafnium, metal compound (s) such as titanium nitride, titanium carbonitride, titanium carbide, and/or other non-metal elements such as nitrogen, phosphorus, or boron. In some embodiments, the carbon coating can further include a ceramic material. The carbon coating can be formed by established methods. For example, a chemical vapor deposition process can be used to form a diamond-like coating is known in the literature (Handbook of Chemical Vapor Deposition-Principles, Technology and Application, 2nd edition by Hugh O. Pierson, Noyes Publication. In some embodiments, the bioactive agents can be SODm, heparin, polyethylene glycol/oxide, sialic acid, hyaluronic acid, polyethylene glycol/oxide-attached bioactive agents, synthetic peptides and natural proteins, nitric oxide donor molecules or combinations of thereof. SOD can have important effects on vascular pathophysiology. For example, SOD1-deficient mice have been found to produce more superoxide than their wild-type controls and have decreased endothelium-dependent and -independent vasodilation. SOD1 overexpression in mice causes a decrease in vascular smooth muscle cell (VSMC) proliferation in response to endothelial growth factor (EGF) but no change in the aortic hypertrophic response to Angiotensin II. A separate study with mice overexpressing SOD1 on the apoE−/− background showed no significant effect on aortic atherosclerotic lesion area. Total SOD2 deficiency is lethal in mice, and although partial SOD2 deficiency has been shown to cause an increase in atherosclerotic lesion formation at arterial branch points, there was no effect on vasomotor responses to serotonin, PGF2α, or acetylcholine at baseline or after inhibition of SOD 1 and SOD3 with diethyldithiocarbamate. The second most abundant SOD isoform in blood vessels is SOD3, which is predominantly produced by VSMCs, but because its location in the interstitium between ECs and VSMCs it is thought to be essential for endothelial-dependent vasodilation by protecting NO as it diffuses from the ECs to the VSMCs. These differences in the regulation of vascular tone or in the formation of atherosclerotic lesions indicate the potential importance of the subcellular localization of antioxidant systems in the modulation of local oxidant signaling. SODm includes any compounds that provides for functions similar to those of SOD. Such examples of SODm include peptide mimetics of SOD. Another example of SODm is a manganese-based, low molecular weight (MW=543) SOD complex with the structure illustrated below. In some embodiments, the bioactive agent can be a polymer, or polymeric conjugate of a bioactive agent, that imparts a favorable biological property or properties to the carbon coating. Such polymers, or polymer conjugates, can be, e.g., polyethylene glycol (PEG) or polyethylene oxide (PEO), polyethylene glycol/oxide derivative, sodium hyaluronate and its derivatives, sialic acid, synthetic peptides or natural proteins, synthetic or natural polysaccharides, aloe derived pectin (DelSite Inc.), recombinant human gelatin (Fibrogen), etc. As used herein, the term heparin includes sodium heparin, low molecular weight heparins, heparin derivative, heparinoids, or fragments of these. The bioactive agents described above can also be pegylated active agents. Pegylated bioactive agents are active agents modified or otherwise derivatized with poly(ethylene glycol). The term pegylated bioactive agent are also referred as “pegylated drug” or “pegylated active agent”. In some embodiments, the bioactive agent or drug described herein can specifically exclude any one or more of the above listed agents or drug. In some embodiments, attachment of the bioactive agents to the carbon coating can be induced via photo activation. For example, photo-reactive chemical(s) (PRC) can extract hydrogen on the surface in the form of C—H or Si—H bonds, and covalently couple directly to the surface. If the PRC contains chemically reactive groups, bioactive agents, such as SODm and/or heparin, can be bound to the PRC. As a result, a desired biological agent can be covalently grafted to the carbon surface. In some embodiments, attachment of the bioactive agents to the carbon coating can be induced via thermal activation. For example, thermo-reactive chemical(s) (TRC) can extract hydrogen on the surface in the form of C—H or Si—H bonds, and covalently couple directly to the surface. If the TRC contains chemically reactive groups, bioactive agents, such as SODm and/or heparin, can be bound to the PRC. As a result, a desired biological agent can be covalently grafted to the carbon surface. Examples of PRCs include, but are not limited to, the ones from the benzophenone family, i.e. benzophenone tetracarboxylic dianhydride, benzoylbenzoic acid, benzoyl benzoyl chloride, 4-benzoylbenzoic acid N-hydroxysuccinimide ester, benzoyl benzoyl amine, or from azide family, i.e. substituted phenyl azide and substituted acyl azide. The hydrogen extraction can be initiated by light, e.g. ultraviolet (UV), exposure of the PRC entity or thermal exposure of the TRC entity. The derivatives of PRC and TRC compounds contain the chemical reactive groups as a coupling agent. The coupling reaction between PRC or TRC to the biologically active agent will be dependent on the specific structure of the PRC or TRC molecule but can be readily carried out by an ordinary artisan. For example, an amine functional group on SODm can react with an anhydride or acyl chloride of substituted benzophenone. The PRC or TRC can be coupled to the carbon surface first and then coupled with the biological agent, or vice versa. For example, some examples of reactive group on PRC or TRC include, but are not limited to, an acid group (e.g., carboxylic group, sulfonic acid group, phosphoric acid group, phosphonic acid group, sulfuric acid group), hydroxyl group, amino group, thiol group, aldehyde, keto, acetal, etc. The bioactive agents either include or can be made to include a reactive group such as an acid group (e.g., carboxylic group, sulfonic acid group, phosphoric acid group, phosphonic acid group, sulfuric acid group), hydroxyl group, amino group, thiol group, aldehyde, keto, acetal, etc. Attachment of the bioactive agent to the carbon coating can then be readily achieved by reaction between the reactive group on the PRC or TRC and the reactive group on the bioactive agent. For example, the carboxylic acid group of the PRC or TRC molecule can form an ester bond with a drug molecule via an established procedure in the art of organic synthesis. Generally, the attachment the bioactive agent to the PRC or TRC via a carboxylic acid group can be achieved according to Scheme 1 as described below. In Scheme 1, R represents a drug molecule or a derivative thereof. X represents a leaving group attached to the drug molecule. For example, X can be OH, a halo group, mesylate or tosyl group, and any other groups capable of leaving the drug molecule in forming the drug/PRC ester bond. PRC can also be TRC. Alternatively, the attachment can be achieved via a hydroxyl group in the PRC molecule and a carboxylic acid in R, as shown in Scheme 2. In Scheme 2, R represents a drug molecule or a derivative thereof. X represents a leaving group attached to the drug molecule. For example, X can be OH, a halo group, an imidazole group, an o-AcyhLrea group, an NHS or Sulfo NHS group, and any other groups capable of leaving the drug molecule in forming the drug/PRC ester bond. For example, mesylate or tosylate can be leaving groups since they can be used to derivatize —OH functional materials. PRC can also be TRC. In alternate embodiments, the PRC or TRC can be derivatized on the stent to have a good leaving group (e.g., imidazole via reaction with carbonyl di-imidazole), and this can subsequently react with a hydroxyl or amine group on the drug or bioactive polymer. In some other embodiments, the attachment described herein can be achieved via forming an imine Schiff base by PRC-CHO or TRC-CHO with an amine-containing drug (Scheme 3) or vice versa. As shown in Scheme 3, the aldehyde group of PRC-CHO can react with the amine group of an amine-containing drug to form an imine Schiff base, which is hydrolytically unstable and can release the amine-containing drug under in vivo conditions. An alternative strategy for attaching a bioactive agent can be carried out by the reaction of the amino group of PRC-NH2 or TRC-NH2 with a keto group on the drug molecule to form an imine Schiff base linkage. In some embodiments, the stabilization of the Schiff base can be achieved by hydrogenation using for example, the reducing agent Sodium cyanoborohydride. Again, in Scheme 3, PRC can be replaced with TRC. In still some other embodiments, the attachment described herein can be achieved via forming an acetal or hemi-acetal by PRC-CHO or TRC-CHO with a hydroxyl group or hydroxyl groups on a drug (Scheme 4) or vice versa. The acetal or hemi-acetal can undergo hydrolysis under in vivo conditions to release the bioactive agent. As shown in Scheme 4, the aldehyde group of PRC-CHO on the carbon coating can react with hydroxyl group or groups on a drug to form a prodrug with an acetal linkage or hemi-acetal linkage. Alternatively, the hydroxyl group or groups can react with an aldehyde or keto group on a drug to form a prodrug with an acetal linkage or hemi-acetal linkage. Other methods of attaching the bioactive agent to the carbon coating are well documented and readily appreciable by an ordinary artisan (see, for example, Larock, Comprehensive Organic Transformations: A Guide to Functional Group Preparations, John Wiley & Sons, Inc., Copyright 1999). In some embodiments, the attachment of the bioactive agent to the PRC or TRC can be carried out prior to attaching the PRC or TRC to the carbon coating so as to form a carbon coating having bioactive agents attached thereto via the PRC or TRC. The chemistry for achieving this is the same as described above. The bioactive agent can include other agents that are not listed above. Such other bioactive agents can be any bioactive agent, which is a therapeutic, prophylactic, or diagnostic agent. These agents can have anti-proliferative or anti-inflammmatory properties or can have other properties such as antineoplastic, antiplatelet, anti-coagulant, anti-fibrin, antithrombonic, antimitotic, antibiotic, antiallergic, and antioxidant. The agents can be cystostatic agents, agents that promote the healing of the endothelium such as NO releasing or generating agents, agents that attract endothelial progenitor cells, or agents that promote the attachment, migration and proliferation of endothelial cells (e.g., natriuretic peptide such as CNP, ANP or BNP peptide or an RGD or cRGD peptide), while quenching smooth muscle cell proliferation. Examples of suitable therapeutic and prophylactic agents include synthetic inorganic and organic compounds, proteins and peptides, polysaccharides and other sugars, lipids, and DNA and RNA nucleic acid sequences having therapeutic, prophylactic or diagnostic activities. Some other examples of the bioactive agent include antibodies, receptor ligands, enzymes, adhesion peptides, blood clotting factors, inhibitors or clot dissolving agents such as streptokinase and tissue plasminogen activator, antigens for immunization, hormones and growth factors, oligonucleotides such as antisense oligonucleotides and ribozymes and retroviral vectors for use in gene therapy. Examples of anti-proliferative agents include rapamycin and its functional or structural derivatives, 40-O-(2-hydroxy)ethyl-rapamycin (everolimus), and its functional or structural derivatives, paclitaxel and its functional and structural derivatives. Examples of rapamycin derivatives include 40-epi-(N1-tetrazolyl)-rapamycin (ABT-578), 40-O-(3-hydroxy)propyl-rapamycin, 40-O-[2-(2-hydroxy)ethoxy]ethyl-rapamycin, and 40-O-tetrazole-rapamycin. Examples of paclitaxel derivatives include docetaxel. Examples of antineoplastics and/or antimitotics include methotrexate, azathioprine, vincristine, vinblastine, fluorouracil, doxorubicin hydrochloride (e.g. 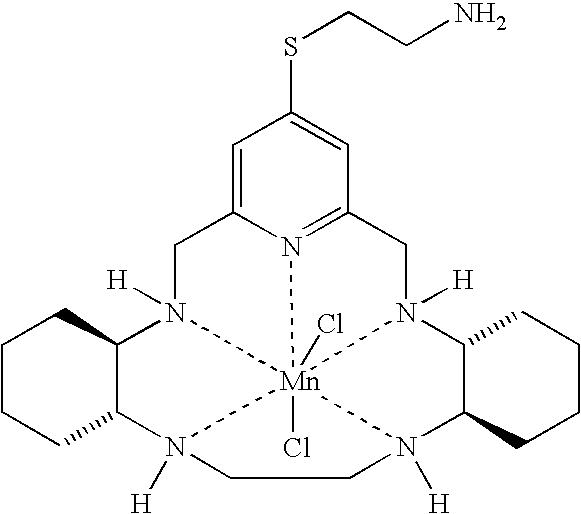 Adriamycin® from Pharmacia & Upjohn, Peapack N.J.), and mitomycin (e.g. Mutamycin® from Bristol-Myers Squibb Co., Stamford, Conn.). Examples of such antiplatelets, anticoagulants, antifibrin, and antithrombins include hirudin, argatroban, forskolin, vapiprost, prostacyclin and prostacyclin analogues, dextran, D-phe-pro-arg-chloromethylketone (synthetic antithrombin), dipyridamole, glycoprotein IIb/IIIa platelet membrane receptor antagonist antibody, recombinant hirudin, thrombin inhibitors such as Angiomax (Biogen, Inc., Cambridge, Mass. ), calcium channel blockers (such as nifedipine), colchicine, fibroblast growth factor (FGF) antagonists, fish oil (omega 3-fatty acid), histamine antagonists, lovastatin (an inhibitor of HMG-CoA reductase, a cholesterol lowering drug, brand name Mevacor® from Merck & Co., Inc., Whitehouse Station, N.J.), monoclonal antibodies (such as those specific for Platelet-Derived Growth Factor (PDGF) receptors), nitroprusside, phosphodiesterase inhibitors, prostaglandin inhibitors, suramin, serotonin blockers, steroids, thioprotease inhibitors, triazolopyrimidine (a PDGF antagonist), nitric oxide or nitric oxide donors, super oxide dismutases, super oxide dismutase mimetic, 4-amino-2,2,6,6-tetramethylpiperidine-1-oxyl (4-amino-TEMPO), estradiol, anticancer agents, dietary supplements such as various vitamins, and a combination thereof. Examples of anti-inflammatory agents including steroidal and non-steroidal anti-inflammatory agents include tacrolimus, dexamethasone, clobetasol, or combinations thereof. Examples of cytostatic substances include angiopeptin, angiotensin converting enzyme inhibitors such as captopril (e.g. Capoten® and Capozide® from Bristol-Myers Squibb Co., Stamford, Conn.), cilazapril or lisinopril (e.g. Prinivil® and Prinzide® from Merck & Co., Inc., Whitehouse Station, N.J.). An example of an antiallergic agent is permirolast potassium. Other therapeutic substances or agents which may be appropriate include alpha-interferon, pimecrolimus, imatinib mesylate, midostaurin, bioactive RGD, and genetically engineered endothelial cells. The foregoing substances can also be used in the form of prodrugs or co-drugs thereof. The foregoing substances also include metabolites thereof and/or prodrugs of the metabolites. The foregoing substances are listed by way of example and are not meant to be limiting. Other active agents which are currently available or that may be developed in the future are equally applicable. The bioactive agents described above can also be pegylated bioactive agents. Examples of such pegylated bioactive agents can be pegylated sirolimus, pegylated everolimus, pegylated zotarolimus, pegylated paclitaxel, pegylated proteins, pegylated peptides, etc. As used herein, an implantable device may be any suitable medical substrate that can be implanted in a human or veterinary patient. Examples of such implantable devices include self-expandable stents, balloon-expandable stents, stent-grafts, grafts (e.g., aortic grafts), heart valve prostheses, cerebrospinal fluid shunts, pacemaker electrodes, catheters, and endocardial leads (e.g., FINELINE and ENDOTAK, available from Abbott Vascular, Santa Clara, Calif.), anastomotic devices and connectors, orthopedic implants such as screws, spinal implants, electro-stimulatory devices. The underlying structure of the device can be of virtually any design. The device can be made of a metallic material or an alloy such as, but not limited to, cobalt chromium alloy (ELGILOY), stainless steel (316L), high nitrogen stainless steel, e.g., BIODUR 108, cobalt chrome alloy L-605, “MP35N,” “MP20N,” ELASTINITE (Nitinol), tantalum, nickel-titanium alloy, platinum-iridium alloy, gold, magnesium, or combinations thereof. “MP35N” and “MP20N” are trade names for alloys of cobalt, nickel, chromium and molybdenum available from Standard Press Steel Co., Jenkintown, Pa. “MP35N” consists of 35% cobalt, 35% nickel, 20% chromium, and 10% molybdenum. “MP20N” consists of 50% cobalt, 20% nickel, 20% chromium, and 10% molybdenum. Devices made from bioabsorbable or biostable polymers could also be used with the embodiments of the present invention. In accordance with embodiments of the invention, the bioactive agents can be released from a carbon coating described herein on a medical device (e.g., stent) during delivery and (in the case of a stent) expansion of the device, or thereafter, and released at a desired rate and for a predetermined duration of time at the site of implantation. Preferably, the medical device is a stent. The stent described herein is useful for a variety of medical procedures, including, by way of example, treatment of obstructions caused by tumors in bile ducts, esophagus, trachea/bronchi and other biological passageways. A stent having the above-described coating is particularly useful for treating diseased regions of blood vessels caused by lipid deposition, monocyte or macrophage infiltration, or dysfunctional endothelium or a combination thereof, or occluded regions of blood vessels caused by abnormal or inappropriate migration and proliferation of smooth muscle cells, thrombosis, and restenosis. Stents may be placed in a wide array of blood vessels, both arteries and veins. Representative examples of sites include the iliac, femoral, popliteal, renal, carotid and coronary arteries. For implantation of a stent, an angiogram is first performed to determine the appropriate positioning for stent therapy. An angiogram is typically accomplished by injecting a radiopaque contrast agent through a catheter inserted into an artery or vein as an x-ray is taken. A guidewire is then advanced through the lesion or proposed site of treatment. Over the guidewire is passed a delivery catheter which allows a stent in its collapsed configuration to be inserted into the passageway. The delivery catheter is inserted either percutaneously or by surgery into the femoral artery, brachial artery, femoral vein, or brachial vein, and advanced into the appropriate blood vessel by steering the catheter through the vascular system under fluoroscopic guidance. A stent having the above-described features may then be expanded at the desired area of treatment. A post-insertion angiogram may also be utilized to confirm appropriate positioning. attaching a bioactive agent to the PRC or TRC via the reactive group via covalent bonding. 2. The method of claim 1, wherein the carbon coating further comprises covalently linked silicon (Si) and oxygen (O) atoms. 3. The method of claim 1, wherein the light is ultraviolet. 4. The method of claim 1, wherein the light is visible. 5. The method of claim 1, wherein the PRC is a compound in the benzophenone family or a compound in the azide family. 6. The method of claim 3, wherein the PRC is selected from group consisting of benzophenone tetracarboxylic dianhydride, benzoylbenzoic acid, benzoyl benzoyl chloride, 4-benzoylbenzoic acid N-hydroxysuccinimide ester, benzoyl benzoyl amine, substituted phenyl azide and substituted acyl azide. 7. The method of claim 1, wherein the TRC is selected from acyl peroxide, akyl peroxide, hydroperoxide, perester, azo compounds, and disulfides. 8. The method of claim 7, wherein the TRC is selected from acetyl or benzoyl peroxides, cumyl or t-butyl peroxide, t-butyl or cumyl hydroperoxide, t-butyl perbenzoate, or azobisisobutylonitrile (AIBN). 9. The method of claim 1, wherein the carbon coating further comprises a metal or a ceramic. 10. The method of claim 1, wherein the bioactive agent is superoxide dismutase (SOD), super oxide dismutase mimetics (SODm), heparin, polyethylene glycol/oxide, polyethylene glycol/oxide derivative, sodium hyaluronate and its derivatives, sialic acid, synthetic peptides or natural proteins, synthetic or natural polysaccharides, aloe derived pectin (DelSite Inc.), recombinant human gelatin (Fibrogen), nitric oxide donor molecules or combinations of thereof. 11. The method of claim 1, wherein the bioactive agent is selected from paclitaxel, docetaxel, estradiol, 4-amino-2,2,6,6-tetramethylpiperidine-1-oxyl (4-amino-TEMPO), tacrolimus, dexamethasone, rapamycin, rapamycin derivatives, 40-O-(2-hydroxy)ethyl-rapamycin (everolimus), 40-O-(3-hydroxy)propyl-rapamycin, 40-O-[2-(2-hydroxy)ethoxy]ethyl-rapamycin, and 40-O-tetrazole-rapamycin, 40-epi-(N1-tetrazolyl)-rapamycin (ABT-578), clobetasol, pimecrolimus, imatinib mesylate, midostaurin, prodrugs thereof, co-drugs thereof, pegylated drug thereof, and a combination thereof. 12. The method of claim 1, wherein the implantable device is a stent. 13. The method of claim 1, wherein the implantable device is a bioabsorbable stent. applying a light to the carbon coating exposed to the PRC or heat to the carbon coating exposed to TRC to cause the PRC or TRC to attach to the carbon coating. 15. The method of claim 14, wherein the carbon coating further comprises covalently linked silicon (Si) and oxygen (O) atoms. 16. The method of claim 14, wherein the light is ultraviolet. 17. The method of claim 14, wherein the light is visible. 18. The method of claim 14, wherein the PRC is a compound in the benzophenone family or a compound in the azide family. 19. The method of claim 16, wherein the PRC is selected from group consisting of benzophenone tetracarboxylic dianhydride, benzoylbenzoic acid, benzoyl benzoyl chloride, 4-benzoylbenzoic acid N-hydroxysuccinimide ester, benzoyl benzoyl amine, substituted phenyl azide and substituted acyl azide. 20. The method of claim 14, wherein the TRC is selected from acyl peroxide, akyl peroxide, hydroperoxide, perester, azo compounds, and disulfides. 21. The method of claim 20, wherein the TRC is selected from acetyl or benzoyl peroxides, cumyl or t-butyl peroxide, t-butyl or cumyl hydroperoxide, t-butyl perbenzoate, or azobisisobutylonitrile (AIBN). 22. The method of claim 14, wherein the carbon coating further comprises a metal or a ceramic. 23. The method of claim 14, wherein the bioactive agent is superoxide dismutase (SOD), super oxide dismutase mimetics (SODm), heparin, polyethylene glycol/oxide, polyethylene glycol/oxide derivative, sodium hyaluronate and its derivatives, sialic acid, synthetic peptides or natural proteins, synthetic or natural polysaccharides, aloe derived pectin (DelSite Inc.), recombinant human gelatin (Fibrogen), nitric oxide donor molecules or combinations of thereof. 24. The method of claim 14, wherein the bioactive agent is selected from paclitaxel, docetaxel, estradiol, 4-amino-2,2,6,6-tetramethylpiperidine-1-oxyl (4-amino-TEMPO), tacrolimus, dexamethasone, rapamycin, rapamycin derivatives, 40-O-(2-hydroxy)ethyl-rapamycin (everolimus), 40-O-(3-hydroxy)propyl-rapamycin, 40-O-[2-(2-hydroxy)ethoxy]ethyl-rapamycin, and 40-O-tetrazole-rapamycin, 40-epi-(N1-tetrazolyl)-rapamycin (ABT-578), clobetasol, pimecrolimus, imatinib mesylate, midostaurin, prodrugs thereof, co-drugs thereof, pegylated drug thereof, and a combination thereof. 25. The method of claim 14, wherein the implantable device is a stent. 26. The method of claim 14, wherein the implantable device is a bioabsorbable stent. wherein the carbon coating comprises covalently linked carbon (C), and hydrogen (H) atoms. 28. The implantable device of claim 27, wherein the carbon coating further comprises covalently linked silicon (Si) and oxygen (O) atoms. 29. The implantable device of claim 27, wherein the PRC is ultraviolet reactive. 30. The implantable device of claim 27, wherein the PRC is visible light reactive. 31. The implantable device of claim 27, wherein the bioactive agent is attached to the PRC or TRC via at least one reactive group. 32. The implantable device of claim 27, wherein the PRC is a compound in the benzophenone family or a compound in the azide family. 33. The implantable device of claim 32, wherein the PRC is selected from group consisting of benzophenone tetracarboxylic dianhydride, benzoylbenzoic acid, benzoyl benzoyl chloride, 4-benzoylbenzoic acid N-hydroxysuccinimide ester, benzoyl benzoyl amine, substituted phenyl azide and substituted acyl azide. 34. The implantable device of claim 27, wherein the TRC is selected from acyl peroxide, akyl peroxide, hydroperoxide, perester, azo compounds, and disulfides. 35. The implantable device of claim 27, wherein the TRC is selected from acetyl or benzoyl peroxides, cumyl or t-butyl peroxide, t-butyl or cumyl hydroperoxide, t-butyl perbenzoate, or azobisisobutylonitrile (AIBN). 36. The implantable device of claim 27, wherein the carbon coating further comprises a metal or a ceramic. 37. The implantable device of claim 27, wherein the bioactive agent is superoxide dismutase (SOD), super oxide dismutase mimetics (SODm), heparin, polyethylene glycol/oxide, polyethylene glycol/oxide derivative, sodium hyaluronate and its derivatives, sialic acid, synthetic peptides or natural proteins, synthetic or natural polysaccharides, aloe derived pectin (DelSite Inc.), recombinant human gelatin (Fibrogen), nitric oxide donor molecules or combinations of thereof. 38. The implantable device of claim 27, wherein the bioactive agent is selected from paclitaxel, docetaxel, estradiol, 4-amino-2,2,6,6-tetramethylpiperidine-1-oxyl (4-amino-TEMPO), tacrolimus, dexamethasone, rapamycin, rapamycin derivatives, 40-O-(2-hydroxy)ethyl-rapamycin (everolimus), 40-O-(3-hydroxy)propyl-rapamycin, 40-O-[2-(2-hydroxy)ethoxy]ethyl-rapamycin, and 40-O-tetrazole-rapamycin, 40-epi-(N1-tetrazolyl)-rapamycin (ABT-578), clobetasol, pimecrolimus, imatinib mesylate, midostaurin, prodrugs thereof, co-drugs thereof, pegylated drug thereof, and combinations thereof. 39. The implantable device of claim 27, wherein the implantable device is a stent. 40. The implantable device of claim 27, wherein the implantable device is a bioabsorbable stent. 41. A method of treating or preventing a disorder, comprising implanting in a human being an implantable device according to claim 27, wherein the disorder is selected from the group consisting of atherosclerosis, thrombosis, restenosis, hemorrhage, vascular dissection or perforation, vascular aneurysm, vulnerable plaque, chronic total occlusion, claudication, anastomotic proliferation for vein and artificial grafts, bile duct obstruction, ureter obstruction, tumor obstruction, and combinations thereof. 42. A method of treating or preventing a disorder, comprising implanting in a human being an implantable device according to claim 38, wherein the disorder is selected from the group consisting of atherosclerosis, thrombosis, restenosis, hemorrhage, vascular dissection or perforation, vascular aneurysm, vulnerable plaque, chronic total occlusion, claudication, anastomotic proliferation for vein and artificial grafts, bile duct obstruction, ureter obstruction, tumor obstruction, and combinations thereof. ES2355784A1 (en) * 2009-09-21 2011-03-31 Universitat De Valencia SOD mimetic metal complexes.